Numb and tingling extremities is a symptom that can strike at any time of life, but especially during periods of hormonal imbalance, like menopause. Fortunately, there are things you can do to relieve numbness and tingling. 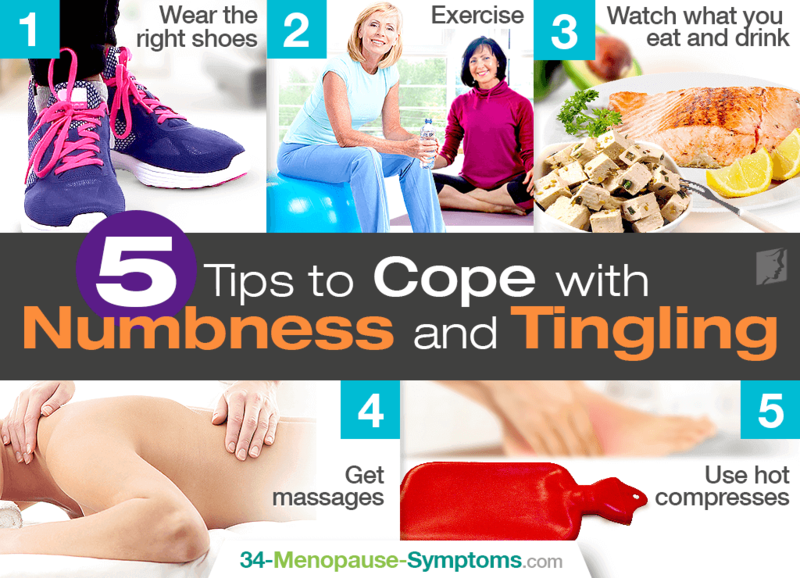 Continue reading to discover the five top tips to cope with numbness and tingling in your hands and feet. Shoes that pinch your toes, like high and pointy heels, can cause discomfort and eventual numbness from loss of feeling. Wear correctly fitted shoes with ample space for your toes to stretch out and feet to breathe properly. Also, consider adding insoles for added support. Exercising can have a drastically positive effect upon numbness and tingling as it can promote circulation of the blood, and endorphins released while partaking in physical activity can act as a sort of temporary pain reliever. Consider exercises such as yoga, Pilates, and tai chi. Try to cut back on alcohol consumption since it can directly contribute to numbness and tingling in the extremities and overall endocrine system disarray. Making sure you maintain a healthy, balanced diet of foods rich in omega-3s and phytoestrogens for optimal nervous and endocrine system health. Considered part of complementary medicine, massage therapy for numbness and tingling pumps oxygen and nutrients to the extremities, thus improving circulation. This can also relieve pain by acting on pressure points. Differing types of massages include connective tissue, deep-tissue, and neuromuscular, among others. Local heating has been scientifically proven to increase blood circulation, thus helping provide immediate relief for tingling extremities in the hands or feet. Use a hot water bottle wrapped in a towel and lay it on your feet or hold it in your hands. Without a doubt, numbness and tingling in your hands and feet can be an annoying, yet rather common, symptom of menopause. By following these five tips, you can lessen the severity and frequency of the symptom, but ultimate relief comes from enacting treatments for tingling extremities. Find out how to stop them in their tracks by clicking on the previous link.